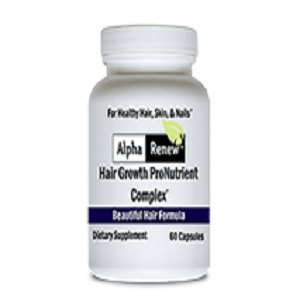 Alpha Renew Hair Growth ProNutrient Complex aims to give the user hair that is healthier, longer and stronger. It helps support hair growth and can be used daily. Alpha Renew is ideal for all hair types and for both men and women. Here, we provide a brief synopsis about the product and provide you with more information to ascertain whether this is something for you. The ingredients contained within this product are comprehensive and cover many aspects associated with hair loss. Folic Acid – helps tissues and organs grow, beneficial for general wellbeing, as well as hair growth. Gelatin – significant element during the development of healthy hair and skin. Gingko Biloba – prevents hair loss and promotes hair growth. Horsetail – helps in absorbing several minerals and vitamins and in developing healthy hair. Inositol – critical to several body processes and important for healthy hair. MSM – consumable sulfur compound, beneficial for healthy skin and hair. Vitamin A – essential element for hair growth. with superb antioxidant and anti-ageing properties. Vitamin B-3 – helps the development of healthy hair and skin. Vitamin B-6 – works in conjunction with vitamin B-5 and is extremely important for healthy hair. Vitamin C – has healing and supportive properties that fight free-radicals and helps absorption of other minerals and vitamins into the body. Vitamin D – essential vitamin for great hair and skin development. Zinc – proven to benefit the development of healthy hair. Unfortunately, since this product contains gelatin as one of its ingredients, it is not vegan and vegetarian-friendly. This, we felt limits some consumers. The recommended dosage is two capsules per day with meals. The manufacturer recommends consulting with a health care professional before beginning consumption of this product. According to the manufacturer, this product is totally drug-free. There are no known side effects, because the ingredients are completely natural. A one month supply of Alpha Renew costs $19.95, a saving on the list price of $24. Buying the product in multiples of a month’s supply, results in a reduction in per unit price. In addition, the manufacturer gives you a saving of 10% off for subscribing to their email list. The manufacturer does have a refund policy. The product must be returned within a time-frame of 30 days with unopened and unaltered bottles. This means that if you have tested the product and are unsatisfied with the result, you will not get your money back. The range of ingredients in this product are very good, all significant in boosting hair growth and development, focused and targeted for every stage of the hair growth cycle. In addition, it does not have any noted side effects and is suitable for all hair types and for both men and women. On the flip side, the manufacturing facilities are not GMP compliant, plus the manufacturer does not allow for returns of the product if the bottle has been opened or tampered with. We felt that purchasing a product without guarantees placed consumers slightly at risk. Therefore, if this vitamin supplement did not work for certain costumers, then they would have limited chances of getting their money back. John Brownstone	reviewed AlphaRenew	on July 27th	 and gave it a rating of 2.5.